Left, Meryl Streep performs during the 2016 Public Theater Gala at Delacorte Theater on June 6, 2016 in New York City. Right, Donald Trump. 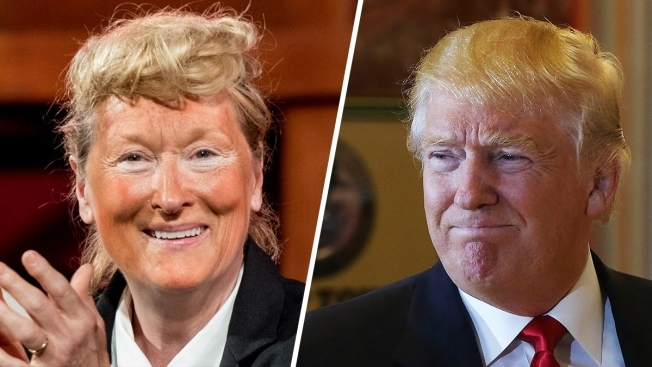 Meryl Streep has made use of a spray tan, a fake belly and an oversized red tie to get in character for her latest role, Donald Trump. The New York Times reports that the three-time Oscar winner took the stage Monday in New York as the presumptive Republican presidential nominee during a gala benefit for the Public Theater. A Times reporter has posted video of the performance on Twitter showing Streep impersonating Trump while performing a duet alongside actress Christine Baranski's pantsuit-clad Democrat Hillary Clinton. The pair sang "Brush Up Your Shakespeare" from Cole Porter's musical "Kiss Me, Kate." Public Theater artistic director Oskar Eustis tells the newspaper that the performance was Streep's idea and "she was absolutely sure she could do it."